Medical Microbiology: Bacterial fitness: Not the way we thought!! Antibiotics is one of that tools that allow modern medicine to evolve. However, with widespread use of antibiotics, resistance has evolved over the period making the scenario worse. I have spent a lot of blog space discussing these issues. I have often argued based on previous papers that acquiring resistance also leads to a compromise in bacterial fitness. Perhaps it appears that we are probably wrong along the way, at least in some case scenarios. Let us first discuss bacterial fitness. The ability to replicate in a given environment is called as bacterial fitness. Essentially, as an extension of the definition we can test the fitness of a bacteria. Let's say you have 2 strains of bacteria- Strain 1 (antibiotic sensitive) and 2 (antibiotic resistance). Grow them under same conditions for a predefined time and count number of bacteria at the end of the time. The one which has produced a higher number of count is by definition "Fitter". Of course you need to compare the same species and counted before the strain reach the stationary phase of growth, for obvious reasons. Earlier studies have shown that in such studies the antibiotic resistant strains had a slower growth rate and hence by definition "loss of fitness". "However, some years ago evidence started appearing that suggests reducing the use of a given antibiotic doesn't necessarily result in a loss of resistance to that antibiotic. Although in some circumstances the number of infections caused by a particular antibiotic-resistant pathogenic bacteria (in a hospital environment) are fewer upon switching to a different class of antibiotic (an approach not wholly without merit), it is not a universally the case, and is also reliant on good infection control practices in the hospital". In a new study by Skurnik etal this concept is explored. The team investigated ~3,00,000 transposon insertion mutants of Pseudomonas aeruginosa from their library and tested for its ability to grow, in invivo condition. The random inoculation of the mixture to C3H/HeN female mice allowed the team to look at the fitness in body environment. The bacteria were recovered from the infected site at different time points and then sequenced. They found that insertion mutations in 116 genes were particularly abundant after a day of growth. They made an interesting example case. oprD is a is a channel for entry of carbapenem antibiotics. The transposon insertion in this case disrupted the carbapenem sensitivity, thus making it resistant. Same time, these strains showed enhanced killing of murine macrophages. They demonstrated similar results in both Acinetobacter baumannii and Vibrio cholera. 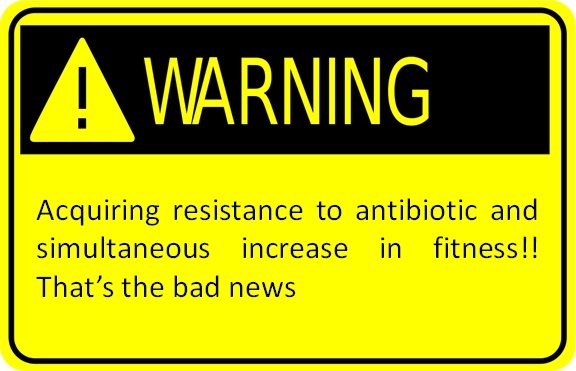 As Skrunik puts it, “The new picture emerging from this work is that antibiotic resistance is not [necessarily] associated with a fitness cost, and is even associated with an increased fitness and an increased virulence". Now that's a bad news. Saying that the bacteria has acquired resistance and also fitness is a very deadly combination since it allows better spread. Arguing that this is a rare phenomenon (only 116 genes from 3,00,000 set is a pretty small number), doesn't seem to help. At the starting point it is a very small set. But with time these organisms will come to predominate since they are resistant and fitter. Its just a matter of time. However, be cautioned that there is a biological difference between mutating a gene using transposons and acquiring a mutation conferring resistance. But the study still makes a case to think about.